Call for Action: Amend the constitution for the protection of all animals. Home / Blog / Call for Action: Amend the constitution for the protection of all animals. 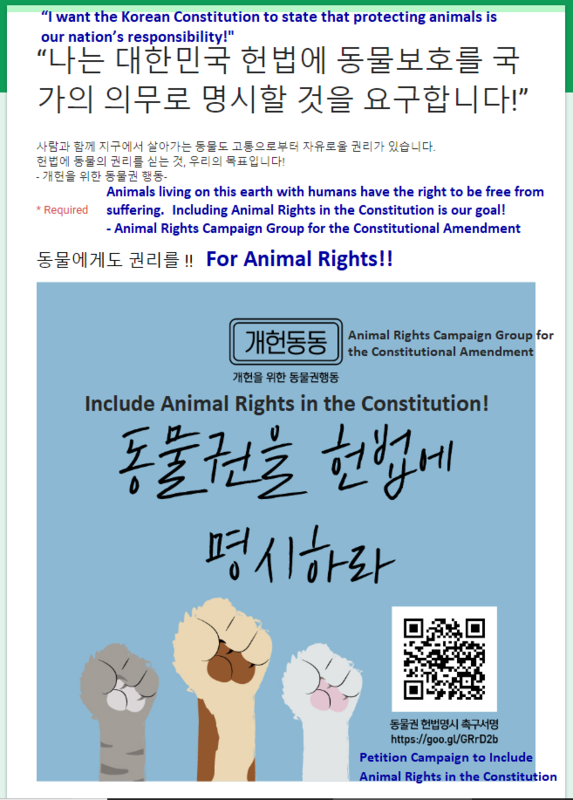 Korean animal rights groups formed to campaign for the amendment to the constitution to declare that animal protection is the responsibility of the nation, has petitions/calls for action. Let us lend our voices to these campaigns. 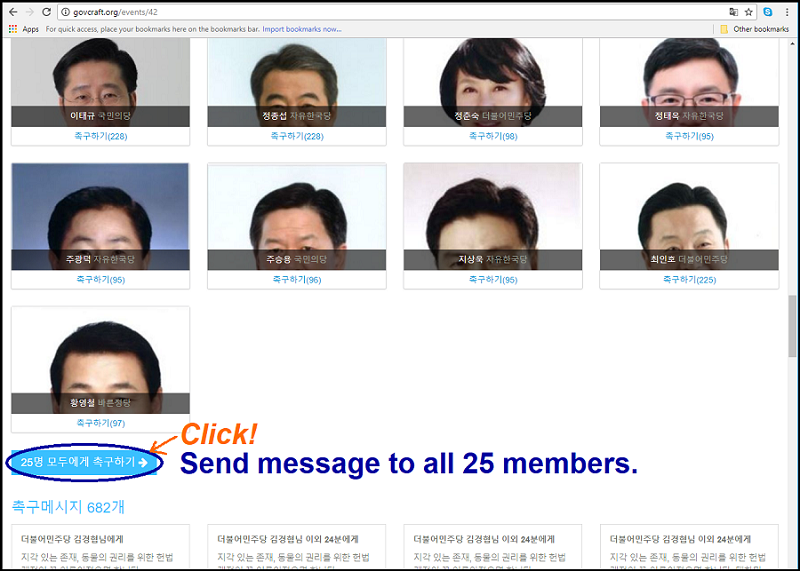 Use our translation of the Korean pages to take action today. Thank you! Click HERE to learn more about the Constitutional amendment. 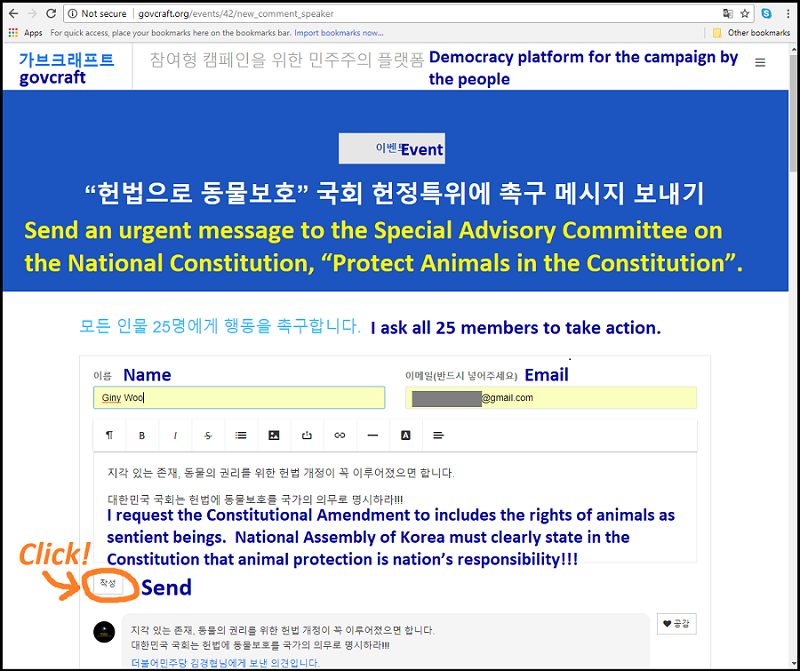 Please click HERE to send an urgent message to the Special Advisory Committee on the National Constitution, “Protect Animals with the Constitution”. You can also click HERE to go directly to the message page. 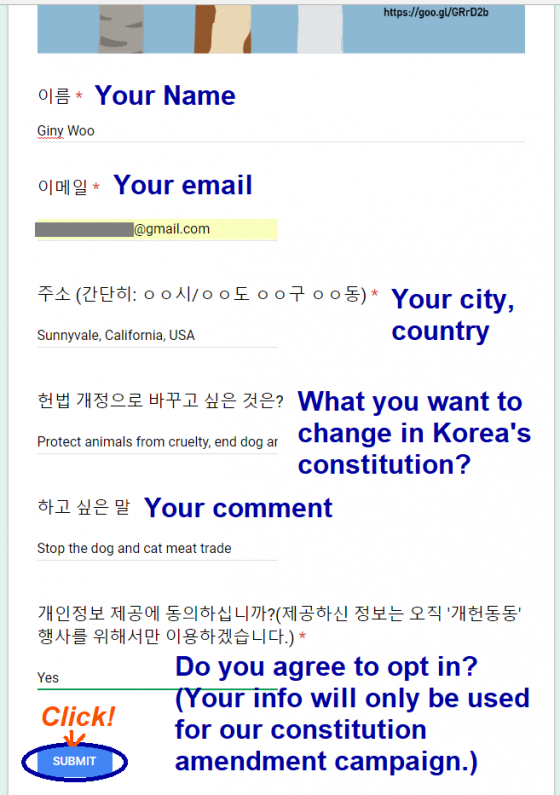 Please click HERE to sign the petition organized by the Animal Rights Campaign Group for the Constitutional Amendment. Animals living on this earth with humans have the right to be free from suffering. Including Animal Rights in the Constitution is our goal! Photos: Korea Animal Rights Advocates. Amend the constitution for the betterment of all animals. End the dog meat trade in Korea. Stop the dog meat trade! Stop this nightmare! Please end the dog and cat meat trade! Please stop this awfull cruelty!!!!! it’s time to stop and ban this disgusting behavior ! South Korea is worthy to do this ! S.Korea is a country with high level of economy and I am surprised that this disgusting and deshonoring trade lasts so long time . 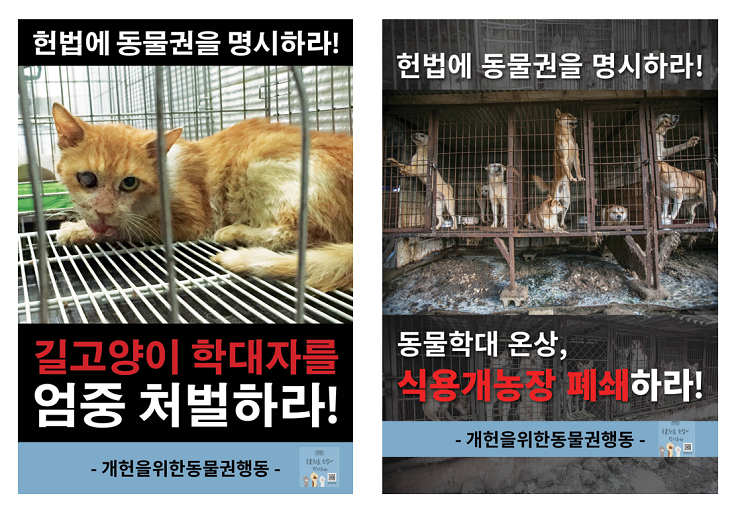 When this horrible trade, torture, killing of dogs and cats will disapear S. Korea will win and will have a good image in our whole world . it’s time to change now !!! and surely I will start to buy south korean stuff !!! This country needs a good wake up call and time to listen to people who will simply never visit your country until this barbaric disgusting torture of defenceless animals stops! You have no idea how worldwide this is now seen and until it stops you only have yourself to blame for your reputation to become even worse than it is now, and eventually nobody with a decent soul will ever visit your country! Animals living on Earth with humans also have the right to be free from pain! BOYCOTT SOUTH KOREA /CHINA AND EVERY SICK EVIL BARBARIC NATION WHO MESSES WITH THE INHUMAN EVIL =DOGS/CATS MEAT TRADE !!! Please stop the farming, slaughtering, & consumption of dogs & cats. The world is watching. Do the right thing! Please stop this barbaric and horrific behavior. Too much blood of these innocent creatures flows on the korean nation. I have just done all three things, sent a personalised message, signed the petition for the constitutional amendment and signed the change.org petition. Only we can help these poor innocent animals and make this cruelty stop. We must make our voices heard and work together to make a change. HELP SAVE THESE INNOCENT ANIMALS. 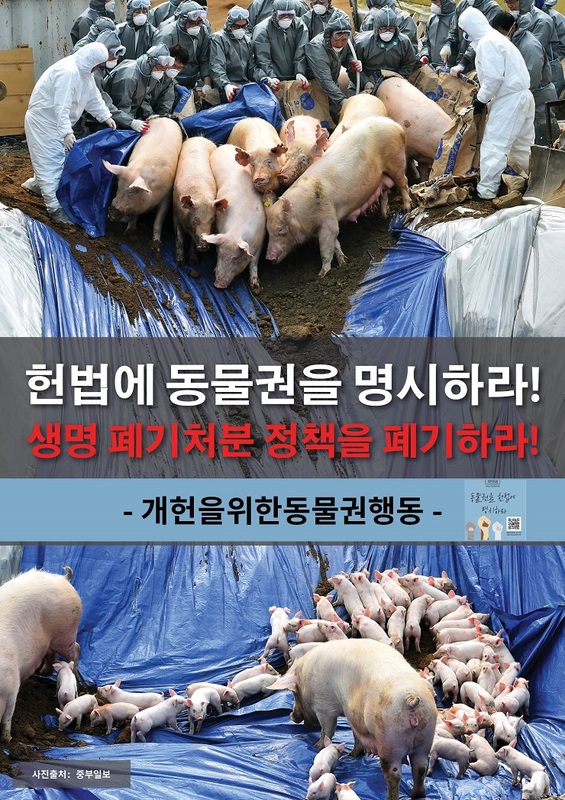 The members of National Assembly of Korea please include protection of animals, their rights to humane treatment, in your constitution. Please choose compassion, help to make this planet victimless for the sake of all its inhabitants. I BELIEVE ANIMAL RIGHTS ARE A SOCIAL JUSTICE ISSUE, AND I WILL SPEAK OUT AGAINST OPPRESSION. IF SOUTH KOREA WANTS TO BE RESPECTED AS A NATION OF CONSIENCE, THE MEMBERS OF NATIONAL ASSAMBLY OF KOREA NEED TO INCLUDE PROTECTION OF ANIMALS NOW!! !WE NEED TO BE STRONG AND RESOLUTE AGAINST THE CRUELTY. This is a sin torturing animals like this. STOP NOW. STOP!!! THIS IS A CRIME AGAINS GOD!!! THE WORLD IS LEARNING MORE & MORE ABOUT WHAT HAPPENS IN SOUTH KOREA. YOU HAVE A DISGUSTING & SICKING WAY OF TREATING ANIMALS. ESPECIALLY DOGS & CATS. YOU TORTURE THEM BEFORE YOU KILL THEM. I WISH HELL WOULD COME TO SOUTH KOREA. YOU PEOPLE DESERVE IT.